Around the farm on the weekends, we usually have some extra time away from our chores to relax and do the little things that we enjoy. For me, I love to cook and to bake. 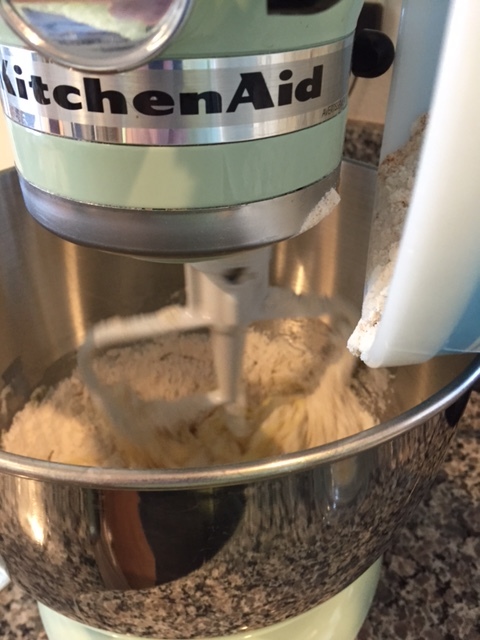 While I often try to bake the things that Cowboy loves most, sometimes I just have to indulge in a just-for-me recipe, and one of my favorite comfort foods is banana bread. Cowboy is not a lover of bananas. Not sure if he had some pre-school trauma, but the man cannot stand the smell of them. However, I buy bananas almost weekly and without fail have a couple that have seen their best days as cereal toppers and snacks. So I have two options – freeze them for a smoothie or bake them into something scrumptious. 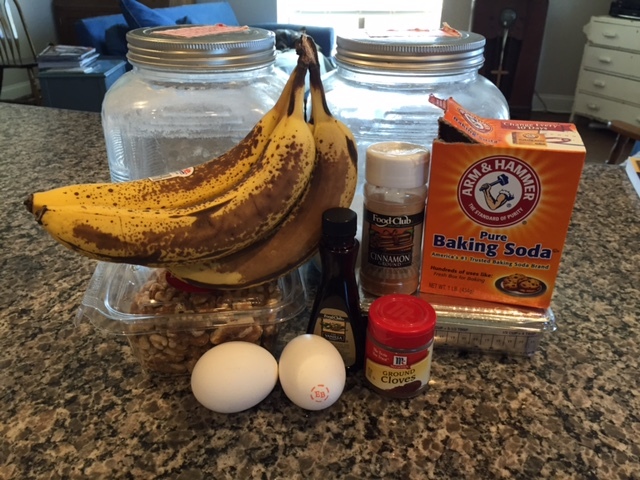 I think the cinnamon and cloves make this banana bread extra special. Give it a try and let me know what you think. Collecting the ingredients to put together this scrumptious treat. Preheat oven to 350 degrees. Butter a loaf pan and dust with flour. Set aside. Cream together sugar and shortening. Add eggs. Sift together flour, baking soda, salt, cinnamon, and ground cloves. Add to wet mixture and mix until well incorporated. Add in vanilla and bananas. Mix until incorporated. Add in walnuts. I find the simplest way to mash my bananas is with a fork on a plate. Scoop them up into a measuring cup and voila. The easiest way to measure mashed bananas is to press them down into a measuring cup. Level with a fork. Pour into prepared and bake for 50 minutes to an hour, until golden brown and when a toothpick inserted into the center comes out clean. Let cool slightly. Turn out of pan and slice. Serve immediately or store in airtight container. Getting ready for the oven. Perfectly golden banana bread ready for snacking. When baking, I always make sure to crack my eggs into a glass and then add them to the mixture. I learned my lesson the hard way when I dropped shells into a mixer in motion. Not fun, not fun at all. Cloves are a strong flavor. I often do a little less than 1/4 tsp. Now if it is full on fall and I’m in the mood, then I’ll add the whole 1/4 tsp. I’d love to hear what you think of this recipe, so give it a try and share your thoughts. Previous Post Where Did January Go? Banana bread sounds delicious. Love. Mom-mom.